Speaker Dan McGaw, founder and CEO of EffinAmazing and former director of marketing at KISSmetrics, is a serial entrepreneur and growth hacker. If you’re just getting started with conversion optimization and find all the CRO tools, techniques and competing priorities overwhelming, this session is for you. 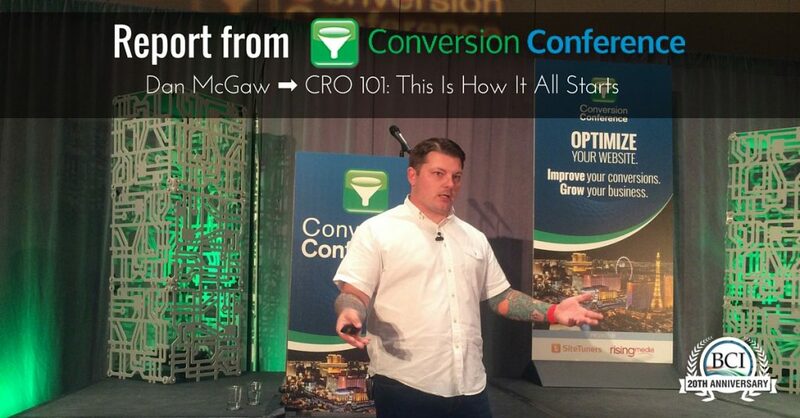 McGaw knows how to kick-start a conversion rate optimization program from the earliest stages, and in this step-by-step session he’ll show you where to start, what to test and which tools you’ll need to ensure your success. You’ll get a detailed process for setting up your analytics/tracking, identifying which optimization opportunities will give you the biggest gains, and selecting the right testing technique. What’s more, you’ll see examples of how Dan has applied these proven optimization processes in real business environments. He’s going to get us started with CRO, including the tools you need and a plan for doing this at your organization. Who does A/B testing? Who does CRO? Who knows the difference? You’ll understand by the end of this presentation. How do I track data? When do I know if the test is conclusive? You don’t need to do anything crazy expensive. Just use search to find the answers. Not hitting your goals? Who has gone to a superior and said I missed the goal? Often, the next step is to do more advertising, throw money at the problem. But a CRO person tries to extract more value from what you have. Try to figure out how to do more with less. You’re not going to be throwing money at the problem. You’re extracting more value. Data is your lifeline. You need to be using your analytics and follow your core metrics. Understand that failing is part of the game. Failing is what you’re going to do. At his company they run 30-40 tests each week and fail 60 percent of the time. These failings are lessons. Get used to failing. Sometimes you have to move on to a different page. A CRO person might get into a rut maximizing the home page. Next thing you know, you’re going to have poured in thousands of dollars of labor and not moved the needle. Move on. There are other pages that make you money. Trello is the second best project management application next to Excel. Create a backlog with Trello. Next Week, This Week and Today are three lists for tests they plan to run. Focus on the things that are going to have the most impact. You don’t need to hire a specific person to do CRO. You can train your team on CRO. Don’t hire people just because they’re local; hire the best talent for the job. Search for what to ask when interviewing for a CRO team member. Then train your team. Also, hire an agency. You need to start with your metric before you do anything. If you start with no metric, how will you know if you’re successful? You might even forget to have a metric that you test across tests, not per test. This is not CRO. When you do A/B testing, there are many tools you may use. Optimizely is free for less than 50,000 visits. Optimizely is the Holy Grail of A/B testing. He’s going to use it for the examples in this presentation. Find the highest trafficked pages on the site, such as blog posts with enough traffic to get statistical significance from your tests. You need to at least have some traffic. Use the WYSIWYG editor. They tested a change of button text. If you have a mobile app, look at Branch.io for tracking downloads. With the one “Buy Now” button change, they got a 21 percent lift in conversions. What Do You Test First? Test buttons: Only test one element change at a time (not color, text, capitalization, etc., all at once) or you won’t know what made the difference. 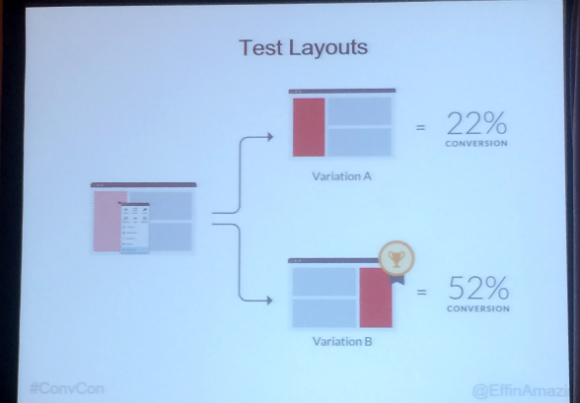 Test layouts: At KISSmetrics, they tested switching the layout 30 times. Why so many times? They let tests run a very long time to get statistical significance, and he calls these “baker tests.” In the end, they found 20+ percent more conversions with the CTAs on one side compared to the other. Tests clearly revealed where to place CTAs for best conversion. Are you looking for something we don’t have? What is preventing you from purchasing? Put these questions on the drop-off on your funnel. CRO uses UX and usability data. UserTesting is one of the best tools out there, he says. They have a Peak program of three free tests a month. Crazy Egg (cheaper version of Hotjar) heat mapping is important for understanding where people are going on the site. A heat map can show that adding an image of a model who is actually looking at the CTA or product will improve conversions. KISSmetrics and mixpanel — these are the tools for gathering quantitative data. Then you run the tests and measure through the standard, Google Analytics. First we need to build our funnel. KISSmetrics makes this dead simple. Create the events for your funnel. 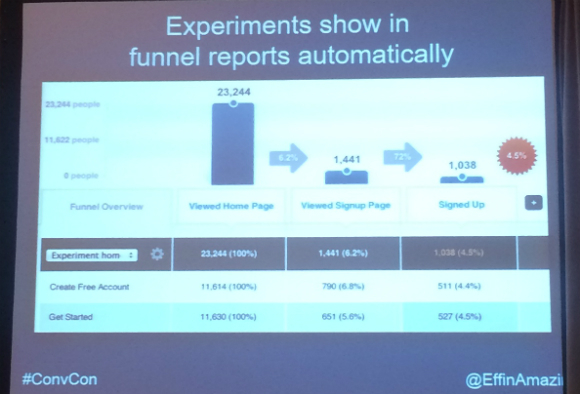 CRO experiments show in conversion funnel reports. In this experiment, we see the funnel reports automatically show a variation between the home page message “create free account” and “get started.” You might see more people go to Step 2 from one version, but more people end up signing up from the other version. Starbucks lifetime customer value is $22,000. WOW! Make sure you’re measuring your lifetime customer value. Let’s look at CRO in practice in a company like T-shirt company James Perse. Through two months of research, surveying customers with questions like “What do you do on the weekend?,” they discovered that their clients are primarily hipsters. They got a 49 percent increase in cart adds when they put a beard on their model! That’s not A/B testing. That’s true CRO — understanding customers. When you’re doing conversion tests, stay focused. Only change one element at a time. Caveat: If you are a tester who has been doing this for years, you can do a “learning test” and that’s a lot of changes at a time. Low traffic? Stick to A/B, not A/B/C tests. If you want to run a high-velocity testing process, you’re going to have the control and one variation. Multi-variant testing (lots of changes) needs lots of traffic — like lots! Don’t call tests too early. An A/B test needs to have statistical significance. Get Data Driven (Getdatadriven.com) is an A/B significance test. Can you walk us through the tools we need? This is hard to answer because every business has specific needs. Hotjar for surveys, polls, heat mapping and session recordings; start there and branch out. When you use Hotjar, how do you read reporting? With heat mapping, you’re looking for how a user goes through the site. Tip: They’ve found that staggered text and images is a conversion killer. Don’t stagger images with text because it makes it harder to read. For session recordings, you’re trying to understand how people use the site. They’ll typically take a junior marketer to analyze. They’re also looking for bugs. They’re used to collect data to see how people are using the page. What’s your methodology for reading through customer surveys and getting value? All these tools can decrease load time. Google Tag Manager. Even with all these tools, with asynchronous loading, the page should load in a second.